New York-based architecture and interiors firm Bluarch has become known for innovative designs that have people looking up. 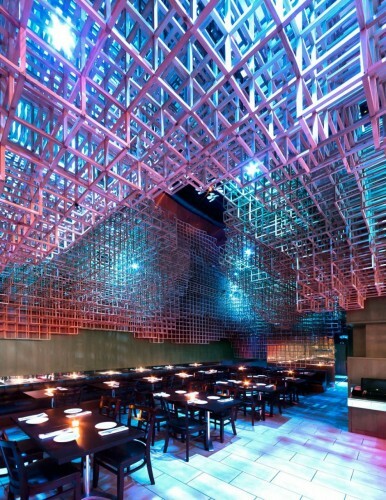 The group has created ceiling installations for residences, restaurants, and retail locations across the world. One of their latest projects is close to home, at Innuendo restaurant and bar in Port Washington. Located on Main Street, the restaurant’s seamless storefront reveals a cloudlike ceiling installation with integrated lighting designed to create an ever-changing atmosphere. Drawing on the idea of fractal geometries, the ceiling’s shapes are the same whether observed from near or far. As the viewer’s distance from the shape increases, “the visual understanding of the form multiplies with the same detail, thus being non-differentiable,” explained Bluarch principal Antonio Di Oronzo. Using Rhino and Autodesk 3ds Max, Bluarch created every layer of the ceiling with simple 6-inch cubes as its basic unit. The design files were handed off to Brooklyn-based fabricator Interiors Palace, who manufactured the cubes with ½-inch-square poplar members. Pieces were preassembled with small metal fasteners into larger sections for installation. Though composed of cubes, the pieces take on a softer form when viewed as a whole. From a functional standpoint, the cloud also softens the space by absorbing sound and providing a surface across which integrated lighting can play. 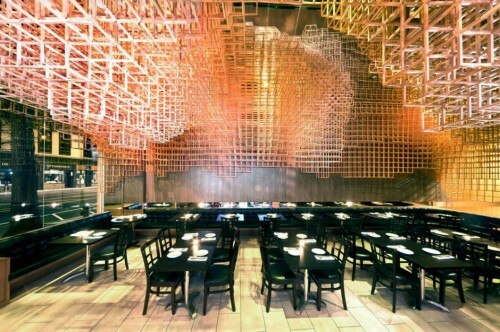 Recessed light fixtures with 60-degree MR 16 RGB LED bulbs fitted with DMX controllers are installed in the ceiling above the cloud, creating points of color and shadow throughout the dining room.